More than 90% of the executives who responded believe diversity and inclusion efforts definitely or probably contribute to a more successful association. However, more than two-thirds do not have a diversity strategy for hiring, retention, or promotion. More than 57% of respondents have an expressed commitment to diversity and inclusion as part of their association’s core values, but more than 57% say their organizations do not have specific action plans that demonstrate a commitment to diversity and inclusion. More than 81% work with diverse others to achieve mutual goals, yet nearly 38% indicate that finding qualified diverse applicants remains a challenge. “This study is an important benchmark for Florida associations,” said FSAE President/CEO Frank Rudd, CAE, CMP. “The data shows a significant incorporation of diversity and inclusion principles, and that Florida associations have begun to make explicit commitments in their mission statements, succession plans, and performance indicators. It also helps our association members, as well as FSAE, identify areas for support and education in order to successfully embed these important principles in every level of an association and its work.” He anticipates FSAE’s Diversity, Equity & Inclusion Task Force will focus on developing resources to address these challenges. Vetted Solutions is an executive search firm specializing in association, nonprofit, and hospitality/destination marketing community recruiting and consulting. Further information on the firm can be found at www.vettedsolutions.com. 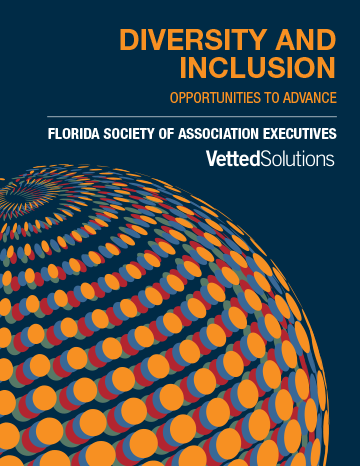 Comments on "Study Reveals Diversity and Inclusion are a Priority For Florida Associations and Provides Growth Opportunities"